Our ambitious new strategic plan will drive our commitment to achieve a greater contribution and impact in improving the health of vulnerable communities. 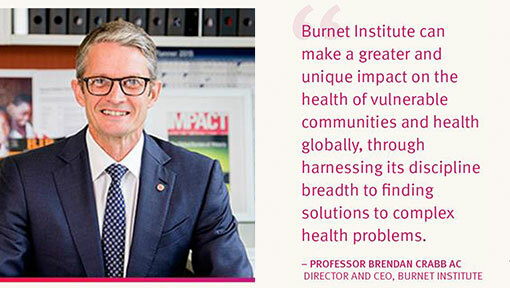 Burnet 2020, the Institute’s ambitious new strategic plan will drive our commitment through to 2020 and beyond, making an even greater contribution to improving the health of vulnerable communities around the world. We are proud to share our strategic blueprint to create a more focused organisation, one that harnesses its remarkable technical breadth to help solve devastating health problems. We are an unaligned, independent organisation that operates with transparency and respect. We are passionate about social justice, equality, evidence-based research and development, and strive to deliver excellence and health solutions through innovation, collaboration and accountability. Burnet 2020 will more fully exploit our international and local field presence, our laboratories, and our mixed development and research cultures to drive greater focus on the most relevant global health issues, and to have a greater impact as a result. It also builds on our rich 30-year history and close links with communities in Myanmar, Papua New Guinea, China, Lao PDR and in other African, Asian and Pacific countries. To achieve our ambitious goals we are changing. We are transforming into a program-led organisation where interdisciplinary health programs will be at the heart of daily decision-making. Our focus will primarily be on Maternal and Child Health, Disease Elimination, Behaviours and Health Risks, and developing two areas of increasing expertise, Health Security and Healthy Ageing. Central to the strategy is the fostering of a talented and committed workforce, a commitment to gender equity, and improving job security.